The 79-day Umbrella Movement of 2014 was a watershed moment in the history of Hong Kong. Not only has the protest movement transformed the political and social dynamics of the city, it has also deeply affected overseas Hong Kong/Chinese communities. Though most would agree that the Umbrella Movement has been transformative, how such transformations are perceived or felt by individuals is much less well documented. 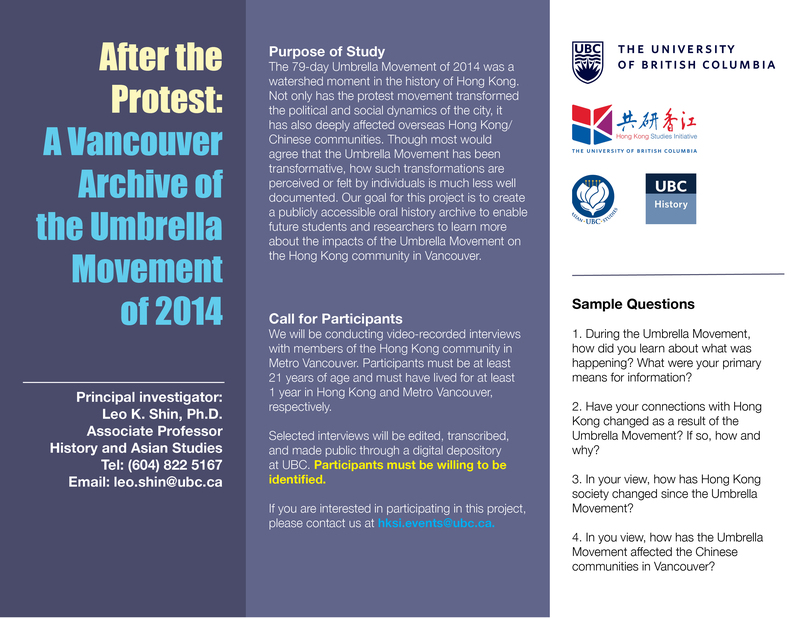 Our goal for this project is to create a publicly accessible oral history archive to enable future students and researchers to learn more about the impacts of the Umbrella Movement on the Hong Kong community in Vancouver. We will be conducting video-recorded interviews (in Cantonese, English, or Mandarin) with members of the Hong Kong community in Metro Vancouver. Participants must be at least 21 years of age and must have lived for at least 1 year in Hong Kong and Metro Vancouver, respectively. Selected interviews will be edited, transcribed, and made public through a digital depository at UBC. Participants must be willing to be publicly identified. Questions? Please contact us at hksi.events@ubc.ca. During the Umbrella Movement, how did you learn about what was happening? What were your primary means for information? Have your connections with Hong Kong changed as a result of the Umbrella Movement? If so, how and why? In your view, how has Hong Kong society changed since the Umbrella Movement? 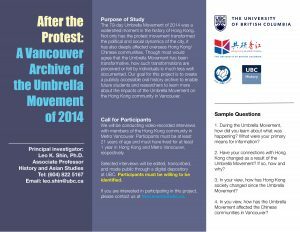 In you view, how has the Umbrella Movement affected the Chinese communities in Vancouver?